Govinda’s Restaurant, housed at ISKCON Jaipur, is a pure vegetarian restaurant which provides a divine dining experience. 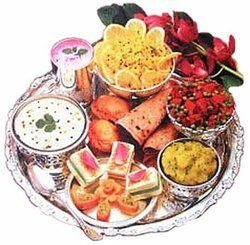 Govinda’s not only serves pure vegetarian meals but everything served is first offered to Lord Krishna – thus the meals are not only tasty but truly transcendental. Govinda’s has a seating capacity of 100 guests. Banquet hall are available for private parties, conferences and marriage. Govinda’s offers Indian, Italian, Chinese and Thai cuisines which include tongue tickling starters, exotic rich dishes, varieties of breads, mouth watering sweets and desserts and tempting ice-cream. Eating at Govinda’s not only satisfies your palate but also elevates your consciousness. An exclusive breakfast buffet with includes 4-5 hot snacks, welcome drink, tea and dessert.